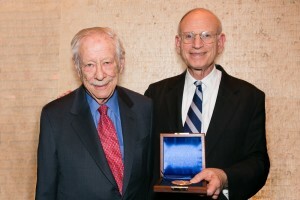 The Honorable W. Michael Blumenthal (l) and Ambassador Stuart Eizenstat at the Center for Jewish History on January 14, 2014. By Christina Domingues. In recognition of his long career in public service and his effective advocacy for the rights of Holocaust victims, Leo Baeck Institute honored Ambassador Stuart E. Eizenstat with the Leo Baeck Medal during its annual award dinner at the Center for Jewish History in Manhattan on Tuesday, January 14, 2014. As Special Representative of the President and Secretary of State on Holocaust-Era Issues during the Clinton Administration, Ambassador Eizenstat negotiated agreements with Switzerland, Germany, Austria, France, and other European countries covering restitution of property, compensation for slavery, recovery of looted art and bank accounts, and payment of insurance policies for Holocaust victims. Eizenstat has also been an important proponent of Holocaust commemoration and education. As an advisor to President Jimmy Carter, he proposed a presidential commission on the creation of a permanent memorial to the victims of the Holocaust in 1978, which culminated in the establishment of the United States Holocaust Memorial Museum 14 years later. He currently serves as the Special Advisor to Secretary of State John Kerry on Holocaust-Era Issues and is Senior Counsel at the Washington, DC law firm of Covington and Burling. “Well, because of you, Stu, I did. I put a call in to representatives of the Claims Conference in Frankfurt […]. Just the other day, they were informed that a small monthly stipend, quite modest, but of great importance to keeping them afloat, will be coming their way,” Blumenthal said.